We offer professional mail handling service to manage your important business correspondences. Business Garden Yotsuya Annex offers professional mail handling service to manage your important business correspondences. 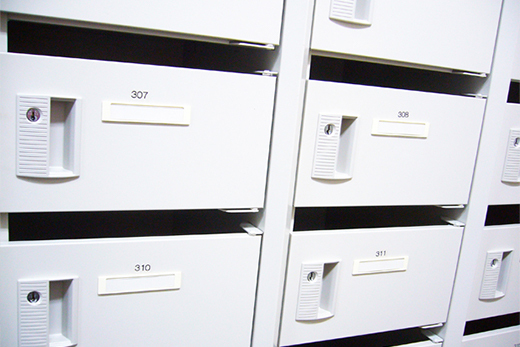 Since we own and manage our entire building, you will get to use our prestigious address as your business address. We do not force you to use a box number in your address, like most other mail handling services. (A box number makes your business appear to be a small start-up company). Postal Office Box mail service. Storage of registered mail, or over-sized packages: 200 Yen per day for each piece. Forwarding Charge:Domestic: 200 Yen per piece plus postage. Overseas: 500 Yen per piece plus postage. * 3 months advance payment required. * Mailbox address cannot be used for company registration. * Registered mail for cash, registered mail from courts, content-certified mail, and certified mail cannot be received and will be returned to the sender. * Mailbox address cannot be used as a forwarding address when moving. * Mailbox address cannot be used for resident registration.